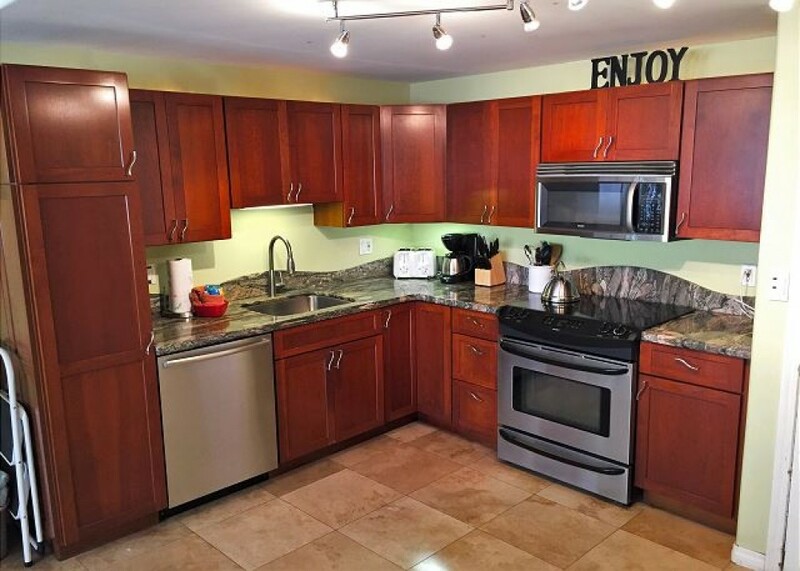 This Haleakala Shores 2-Bedroom condo is perfect for small families or two couples. The floor plan is open and spacious, and wall-to-wall windows give this condo bright light, garden and mountain views. The master bedroom has a comfortable king bed, the 2nd features a queen bed and both offer soft white linens.With attached private bathrooms, both bedrooms are perfect for couples. In both bathrooms, showers have been recently remodeled with glass block showers. The master bath has a full size jacuzzi tub for your relaxation. The kitchen has been recently remodeled, complete with new cabinets, counter tops, and stainless steel appliances. Enjoy outside dining on the spacious lanai. A table and chairs can comfortably seat 4. Located near Kamaole Beach III, one of South Maui’s best white-sand beaches, will make your vacation at Haleakala Shores one to remember. You’ll be just down the road from Wailea. If you enjoy shopping, The Shops at Wailea is for you. This shopping center features a gourmet market and deli, brand name stores, high end jewelry, local artists and a selection of dining experiences. Haleakala Shores is a short walk to the heart of Kihei. It’s the best of both worlds! This resort has a fantastic pool area, complete with Barbecue Grills, and for your beach days, feel free to use the beach towels, beach chairs and beach umbrella we’ve provided for you in your condo. 20% down to hold a reservation. Balance due 45 days before check-in. Holiday and peak season rates and required length of stay may be different than quoted above. Credit cards, checks, and money orders accepted. Minimum night stay varies among the various rental units.